Fifty years ago this week, the NYSID Class of 1964 gathered at The Plaza Hotel (yes, The Plaza!) for a graduation banquet. While sorting through the NYSID Archives, our archivist Nora Reilly came across these amazing photographs. Commencement was slightly different back then, as was NYSID itself. For one, it was a much smaller affair. Though we couldn’t find a definitive count for the Class of 1964, there were a total of 28 students in the Class of 1965. And,there were no caps and gowns, as can be seen from the all-around fantastic outfits below(and hairstyles)above. And, instead of awarding several different degrees (BFA, AAS, MFA, MPS), NYSID awarded a certificate after completing two years of coursework. In 1977, NYSID was granted the right to offer baccalaureate degrees. You can also find some of the early leaders of NYSID in these photos. Pictured here at the far right is a young Arthur Satz, who served as assistant director from 1963-1973 and then director of the College from 1973-1990. 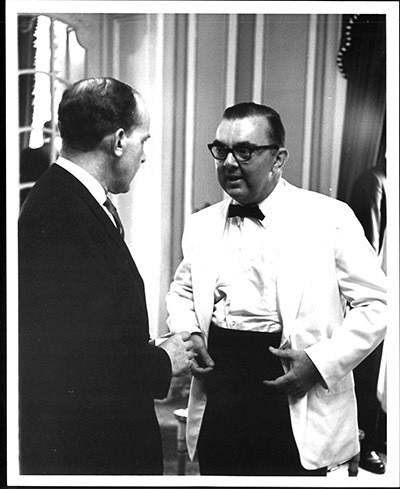 And below in the white tuxedo is Sherrill Whiton, Jr., who was director of NYSID from 1961-1972 and the son of NYSID’s founder, Sherrill Whiton. While commencement may no longer take place at The Plaza, it is still an extraordinary event with so much to celebrate. Keep an eye out for photos of this year’s Commencement Exercises, which takes place tomorrow, Thursday, May 22, 2014. Congratulations to all of our graduates! NYSID. 1965. “Graduation dinner features morsels, morals, and music”. Inside, Summer 1965.